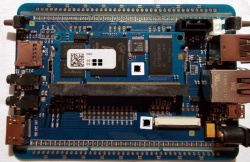 The In-Circuit ICnova A20, also labelled "SoMPi", is a SO-DIMM sized System-On-Module which usually comes with the ADB4006 daughterboard sold by the same company. 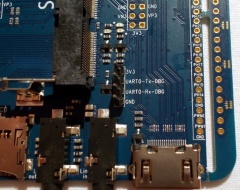 On their website, In-Circuit mentions that they have a Board-Support-Package available, and that they are available for "linux driver development and adaptation", but no such code is available from their website or wiki. The device itself comes shipped with a totally unaltered cubieboard2 cubiez image. After several emails with requests for source code, a link to a buildroot tarball was eventually provided. In their documentation, In-circuit GmbH happily states "Combining the power and software-ease of community proven embedded boards like: +Banana-Pi, Cubie, OlinuXino and PCDUINO3". The provided buildroot tarball clearly uses our sunxi-3.4 kernel, our classic sunxi u-boot, sunxi-tools, sunxi-mali and sunxi-cedarx, so this "community proven" thing is clearly very uni-directional. It is not clear why In-Circuit chose this mode of cooperation with the sunxi community, but it leaves a rather bad taste in the mouth. If you really want to build an embedded device around an Allwinner A20 based SOM, take a look at Olimex A20-SOM instead, or get one of the other Community devices. The SO-DIMM System-On-Module has absolutely no discernable markings on it. Supported. Upstream support still missing. Use the INCIRCUIT_ICNOVA_A20 build target. The 'Boot' button triggers FEL mode. On the top side of the ADB4006 baseboard, there is a nicely marked UART0 connector. Just attached some leads according to our UART howto. There are further headers with UART2/5/6/7 on the board, but they are unpopulated. In-Circuit sometimes calls it SomPi but even the domain sompi.de has now expired (status 20150924). The manufacturer mentions Cubieboard2 images, but of course does not link to these directly. Beware though, Cubieboard2 and this device are of course not 100% compatible (even though In-Circuit claims otherwise). After several requests over more than a week, a link to this buildroot tarball was provided. This page was last modified on 26 May 2016, at 07:32.